I would love you to address the split faced horses in this blog as well. We have several that have a dark side and a white side where the patterns were obviously fighting with each other. Can you link to pictures, Joanne? Do you mean the type of pinto markings where they have a colored patch on one side, but none on the other? Yes, where half of the face is tobiano, and half is frame or splashed white. I realize the content of the joke is rather immature however, the horse on the right seems to have the same overlapping as talked about in this post. I’m not sure if my Welsh Cob (Sec. 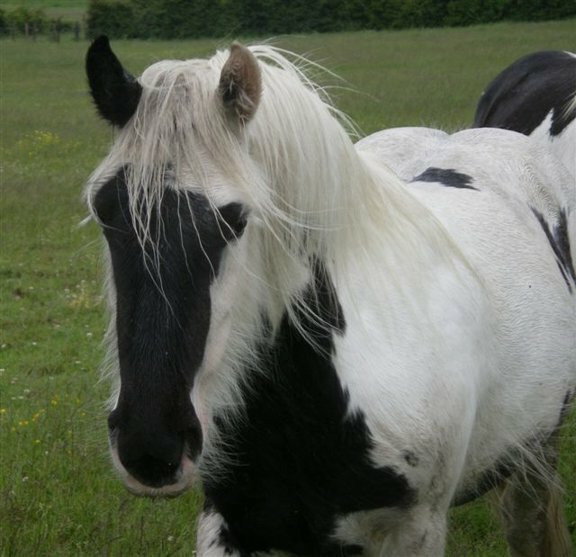 D) mare would count as a split faced horse, but I have always been interested in her ‘harlequin’ stripe where half of her face looks solid and the other side looks ‘smudged’. She is a dark bay mare and appart from her star/stripe/snip, she has no other white markings. We think she exhibits pangare as she has light hair around her eyes, muzzle flanks, throat and chest, behind her elbows and on her belly and backside etc. I am so glad to be able to leave a comment that brings something to the table! This tendency of mammals to have pigmented areas on the forehead while the surrounding skin is unpigmented is, I think, easily explained. As you know, whether or not skin/hair is pigmented is determined most often by whether or not melanoblasts – early melanocytes or pigment cells – have been able to make their way into the skin. This process is carefully timed and occurs during embryonic development; if the melanoblasts do not reach their destinations in time, they miss their chance, and the skin continues to develop without them. The destinations most likely to miss out are the feet, the dorsal aspect of the trunk, and the center of the face. Since we know that this is a timing issue, and that those are the places that are most often missed, we can assume – though you don’t have to – that these places take the longest for the melanoblasts to reach and are furthest from their point of origin. So it seems like they’re coming from the top, down. This link: http://www.stembook.org/node/581#sec2-2 …covers what I am describing. I like to visualize this process as a bunch of cars racing for parking spaces in a limited period of time. What is the point of origin? The top of the organism. Melanoblasts come from the neural crest, but the starting line for the cars in our race isn’t straight across. It turns out that first, melanoblasts “pool” in certain regions. They hang out there, dividing and proliferating, before dispersing. This link: http://www.informatics.jax.org/wksilvers/frames/frame9-1.shtml …discusses what I am describing, and if you look at the figure, there is a helpful drawing. I wasn’t able to find an image that indicated where these melanoblast pools are, though I would have found it useful. You’ll notice that there are several pools on the head. And what about those unusual, reoccurring pigmented dots on the foreheads of mammals? This population of cells corresponds to a distinct pool of melanoblasts, which never have far to travel before their time is up. Even if those migrating from another pool fail to close the gap across the face, it is possible for this pool on the forehead to be unaffected. Not sure if this is still an active page or not, but I’ll give it a try…. I was wondering if occluding spots are a solid indicator of sabino, or can they occur in any solid horse color as well? 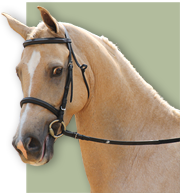 All of the examples you showed seemed to be sabino horses, so do the markings only occur in sabinos? Hello Loghan! Yes, the site is once again active, after several months were I was on hiatus while I worked on the upcoming book. And the whole topic of markings and how to classify them using older terms (like sabino) is undergoing a lot of rethinking right now. I hope you can join us over the next few weeks, since that’s going to be the subject for a number of upcoming blog posts. I have noticed many Tekes have white facial markings that seem truncated. Are there some breeds that exhibit it more often than others?